I don’t remember the first time I went fishing because I was still in diapers but I have great memories of fishing off the dock of our family cottage my grandfather built. I remember having the push button reel, hook, bobber and worms with buckets filled with water at the end of the dock. I would catch perch, sunfish, rock bass and just fill the buckets full of fish then release them when I was done. It’s a fantastic memory and what’s really great is now my boys go up to the cottage and do the same things I did as a child. How long have you been fishing for? I have been fishing for about 30 years now. Basically as far back as I can remember I had a fishing rod in my hand! How do you fish? Shore, kayak, boat, ice, river, sea, something else? Shore, kayak, boat, ice, river, sea, something else- I own two boats- a 14 ft aluminum with a 9.9 motor with a trolling motor and a 1978 16ft aluminum with an enclosed bow and a 55 Chrysler on the back that I restored last year. But I also shore fish and use a canoe/kayak and paddle boat. It’s nice to use something without a motor sometimes to sneak in quietly or gain access to places you can’t with a big boat. There’s also benefits from shore fishing too. Again you can access different spots that you otherwise couldn’t access or may want to target certain fish that are found in river systems etc. I like to switch it up and do as much as I can. Tell us about your favorite spots to fish. That’s easy! I absolutely love those untouched, hard to find places no one else has been to or seen. I really enjoy putting time in and looking for those secret spots. Sometimes when I go searching I find nothing but then when I find those amazing honey holes filled with fish it’s the best feeling ever! I advise any angler to do the same it’s well worth it! Go off the beaten path and find your own slice of fishing heaven! What is it that you enjoy the most about fishing? What I enjoy most about fishing is the fact I’m always learning and will never know it all. Whether it’s new products, species, Lures, bodies of water etc. I’m always learning and doing something new. Plus I like to push myself. The only person I’m ever in competition with is myself so trying to catch my next personal best fish is something I enjoy as well. What’s your favourite fish to catch? Why? I recently got into Muskie fishing and that has quickly become my absolute favourite fish to target. For my area it’s the top predator fish and they truly are “fish of 10,000 casts”. I spent 80 hours on the water solo fishing before I landed my first and it was the best feeling in the world. It also helped that my first Muskie measured 49.5 inches too. I learned so much in that 80 hours and it made me a better angler. With muskie it’s completely different fishing. Your using big heavy gear, massive lures and spending a ton of time on the water. I feel you almost hunt this fish as opposed to fishing for them. Definitely my favourite species so far and I’m looking forward to the 2018 season! Talk us through your greatest fishing adventure! That’s a tough one there’s some pretty great stories to choose from (Another reason I love fishing). But I think one my greatest adventures was when I caught two bass on one lure. I was teaching my boys how to use a top water lure and we were shore fishing across from my old house in this little cove of Lake Ontario. I made my first cast across the cove which landed just before a patch of lily pads. I started working the lure and giving the boys pointers when Bam! Bam! I got a hit. I started to reel and it felt really heavy. I watched the water as I reeled and I couldn’t believe my eyes, no way it couldn’t be?! Yes it was! I had to large mouth bass on one lure! My boys went crazy! I got them up to the shore and I was thrilled. I was officially a fishing queen in my boys eyes (even if it was just for the day). It was definitely an adventure to remember. What do you feel is the most important characteristic in order to be successful angler? I think in order to be a successful angler you need to be open to learn no matter how much you may know. The days I’m skunked are the days I learn the most in all honesty. You need to pay attention to so many things like weather, wind direction, water temps, seasons, types of weeds, structure, moon phases etc etc. The more your willing to learn and the more time you put in the better and more well rounded you will be. Then of course you need to have some serious patience at times too. My biggest catch is my muskie measuring in at 49.5 inches. I unfortunately don’t have the best pictures as we were night fishing but it was an unbelievable catch. My second biggest is also a muskie measuring at about 42 inches. I’m hoping to make it over that 50 inch mark this coming season so we will see. What are your goals in angling for the future? My goals for angling in the future are to just keep growing and I want to become the best angler I can be. I want to get as many new species under my belt as I can. 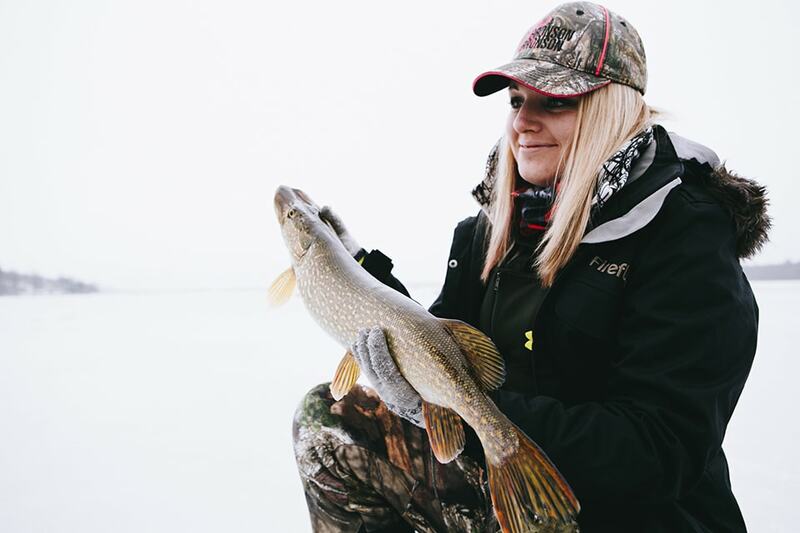 Plus I want to show that female anglers are fantastic members of this sport too. It’s very important to me to show my support to all the other Women of the Outdoors too. I feel very privileged and humble to be able to share my passion for fishing and hunting with so many people. It’s definitely a wonderful thing! !